Smaller shorebirds, commonly referred to as "peeps," can be difficult to identify. However, with careful observation, the Baird's Sandpiper can be distinguished from other species by its streamlined, level-backed appearance, and wings that extend well beyond the tail. This bird breeds in the short grass of the high-arctic tundra of North America and eastern Siberia, and winters in southern South America. While always rare in Tennessee, Baird's Sandpiper has been found in the state in every month save June, December and January! Most spring migrants are present from mid-April to mid-May, and in fall from early August to late September. Baird's Sandpiper can been found across the state, but is more frequently encountered in West Tennessee near the Mississippi River. Description: This medium-sized, short-necked, streamlined shorebird has wingtips that project well beyond the tail tip, a thin, straight bill, white belly, releatively short dark legs, and blurred streaking on the upper chest often washed with buff. The back is mottled gray-brown in non-breeding plumage, and silvery with black spots in breeding plumage. Juvenlile birds (August-November) are similar to adults, but have a buffy-pink cast to the head, back and upper chest. 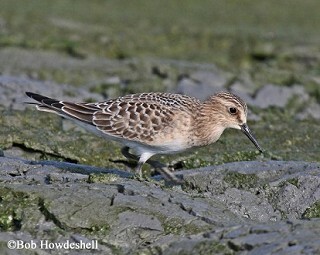 Baird's Sandpiper gives a level-backed appearance when foraging. White-rumped Sandpiper is very similar in size, shape, and markings, but has a bold white rump, is usually grayer in winter with less scaly back-pattern, and brighter in spring. Dunlin larger and with a more down-curved bill. Pectoral Sandpiper larger, with more distinct chest band, and with two thin white stripes down back. Habitat: Found on sandbars, exposed mudflats, and along edges of lakes and ponds while on migration in Tennessee. Often use drier grassier areas of mudflats. Nesting and reproduction: Baird's Sandpiper breeds in the high-arctic with a circumpolar range. Status in Tennessee: Rare but regular spring and uncommon fall migrant, usually present from mid-April to mid-May, and from early August to late September. Baird's Sandpiper has been found in Tennessee in every month of the year except June, December and January. This sandpiper can occur statewide, but is more frequently encountered in far western Tennessee. Most individuals make a dramatic single non-stop 3,700-mile flight from the northern United States to northern South America on their way to spend the winter in central and southern South America. Many individuals complete the entire 9,300-mile journey in as few as 5 weeks.Baird's Sandpiper was one of the last sandpipers to be described in North America. It was named by Elliott Coues in 1861 for his mentor Spencer Fullerton Baird (1823-1887), the secretary of the Smithsonian Institution for many years. 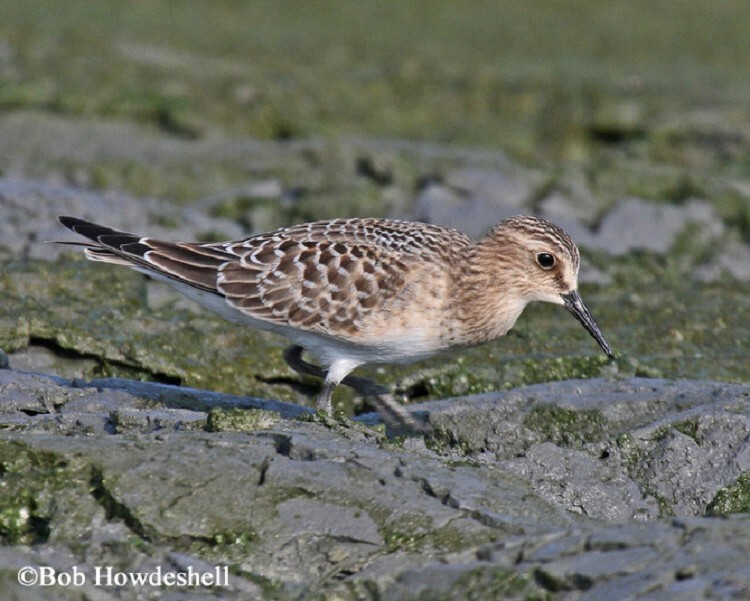 The first Tennessee record of Baird's Sandpiper was in 1936 in Caryville, Campbell County in late August. Although probably overlooked, there were only three additional records until 1970. Shortly after arriving in the Arctic, the female Baird's Sandpiper is able to lay a clutch of eggs that is up to 120% of her body mass in four days, with no stored fat reserves! Soon after the young have developed back feathers that are capable of shedding rain and snow, the adults abandon them to begin their migration south. Without competition for food from the adults, the young probably mature more quickly, and begin their southward migration a month later. Best places to see in Tennessee: The now inaccessible Island 13 in late summer-early fall is one of the best places to find Baird's. Rankin Bottoms also is fairly reliable for a couple individuals annually, as is the Ensley sewage ponds. Moskoff, W., and R. Montgomerie. 2002. Baird's Sandpiper (Calidris bairdii). The Birds of North America No. 661 (A. Poole and F. Gill, eds.). The Academy of Natural Sciences, Philadelphia, PA, and The American Ornithologists' Union, Washington, D.C.